The origins of Italian opera can be traced back to the beginning of the 1600s. Opera has always played an important role in Italian culture. Works by Italian composers of the 19th and early 20th centuries, such as Rossini, Bellini, Donizetti, Verdi and Puccini, count among the most famous operas ever written and are performed in the most prestigious opera houses around the world. Many famous operas by foreign composers, including Händel, Gluck and Mozart, were originally written in Italian. Broadly speaking Italian opera can be divided in two periods, the Baroque and the Romantic. 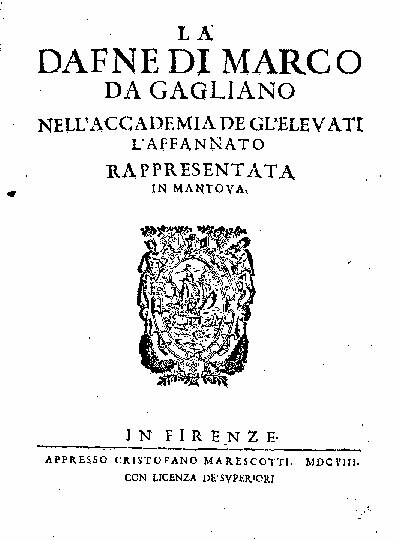 The earliest composition that can be considered opera as we conceive it today, a performance during which the singers enact an entire drama with music throughout, is Dafne written by Jacopo Peri in 1597. It was written in the transitional period between Renaissance and Baroque. Unfortunately, most of the music of Dafne is now lost, but Peri provides a description of the style of musical speech. The first opera for which music has survived to this day is Euridice, with a libretto by Rinuccini, set to music by Peri and Giulio Caccini. It recounted the story of Orpheus and Eurydice and was performed in 1600 at the wedding of Henry IV of France and Marie de Medici at the Pitti Palace in Florence. 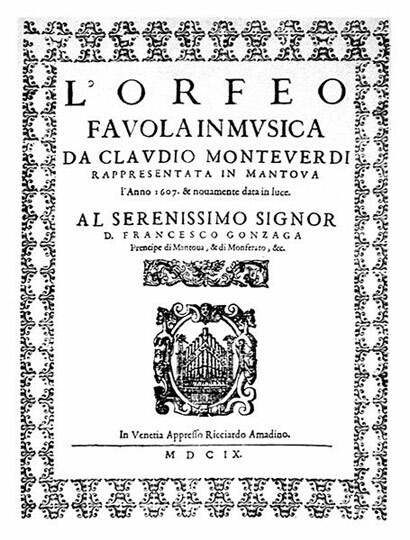 The earliest surviving opera that is still regularly performed today, is Orfeo, the first opera written by Monteverdi for the court of Mantua in 1607. The part of Orpheus is sung by a castrato, starting an operatic tradition that will last for two centuries. Opera took an important new direction when it reached the republic of Venice. It was in the Serenissima that the first public opera house, the Teatro di San Cassiano, was opened in 1637. It was from this moment on that opera moved from noble patronage into the commercial world, making opera accessible to a broader, paying, public, than being restricted to nobility as was previously the case. The chief composer of Venetian opera was Monteverdi, who had moved to the republic from Mantua in 1613. Monteverdi set some of the important standards in Italian opera. The first Italian opera produced outside Italy occured in Warsaw in 1628. By the end of the 1600s two different types of opera appeared Opera Comica or opera buffa and opera seria. In opera buffa the emphasis was on stage action and acting, which required singers who were also excellent actors capable to perform the drama convincingly, but with a smaller cast of characters and simplier plots, requiring less use of scenery and stage machinery. Romantic opera, which placed emphasis on the imagination and the emotions began to appear in the early 19th century. It was initiated by Gioacchino Rossini (1792-1868). His first success was La Cambiale di Matrimonio (1810), an opera buffa. His Barber of Seville, and La Cenerentola are still world famous today. He also wrote opera seria, such as Otello (1816) and Guillaume Tell (1829). Rossini’s successors were Vincenzo Bellini (1801-35), Gaetano Donizetti (1797-1848) and Giuseppe Verdi (1813-1901). The influence of Verdi on the whole process of operatic writing was tremendous. His first important opera, Nabucco (1842), became extremely successful due to the driving vigor of its music and its great choruses. Va, pensiero, one of the chorus renditions, became an anthem for Italian patriots in their struggle for Italian independence and the unification of Italy. Some of the greatest Italian operas of the 20th century were written by Giacomo Puccini (1858 – 1924). 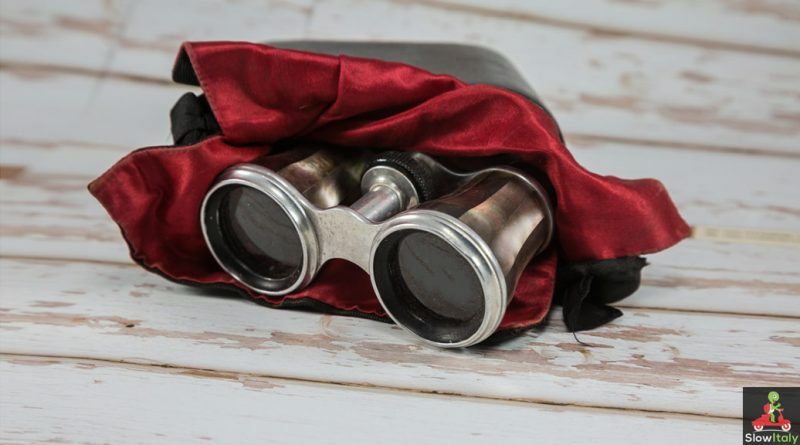 These include Manon Lescaut, La Bohème, Tosca, and Madama Butterfly. Other 20th-century Italian opera composers are Gian Francesco Malipiero (1882 – 1973), Luigi Dallapiccola (1904 – 1975) and Luigi Nono (1924-1990). Today, opera forms the essence of Italian culture.